Don’t let the title confuse you: this is NOT the CQ magazine devoted to ham radio. This one preceded that magazine by more than a decade and was “of, by, and for commercial radio operators”. The SoWP archives contains 11 issues of this journal, all published between 1931 and 1933. It appears that many if not all of these at some point belonged to Dr. Lee DeForest himself, whose hand-written markings can be seen in each issue in his “Pioneer Wireless Operators” series of articles. Most likely he was revising them for use in another one of his publications, possibly one of his books. These rare issues are available for your perusal courtesy of Ken Bales, W7VCB, who preserved them for the Society. CQ Vol 1 No 5, Jul 1931 – “Radio Trust Put on the Spot” (RCA), DeForest series, employment reports, etc. CQ Vol 1 No 8, Oct 1931 – Editorial on radio schools’ inflated promises on careers as commercial radio operator, KPH’s “enviable reputation” being maintained by Frank Geisel (later SoWP President), etc. 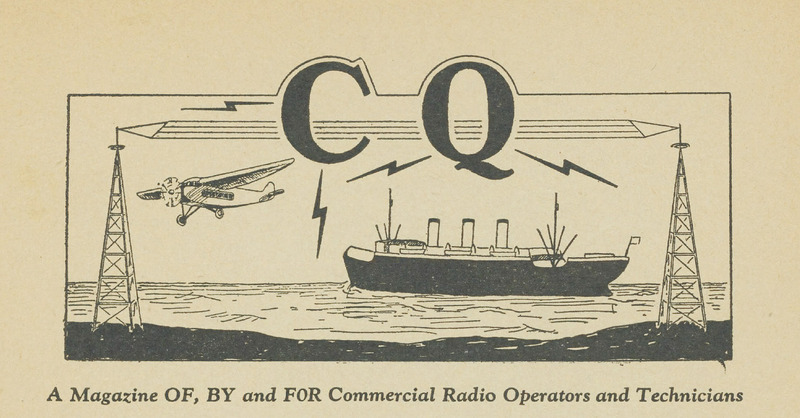 CQ Vol 1 No 10, Dec 1931 – Interesting editorial on steamship companies trying to keep operators from subscribing to this magazine, cuts to wages, more by DeForest on pioneering radio operators, etc. CQ Vol 1 No 12, May 1932 – Legislative bills threatening commercial wireless operators, LAPD radio station KGPL, DeForest on pioneering wireless operators, etc. CQ Vol 2 No 4, Nov Dec 1932 – “Where Is That ‘Prosperity’?”, US Radio Air Service (Hollinger), Crosley 500 kW broadcast transmitter, etc. CQ Vol 2 No 8, Apr 1933 – “Tourist Wireless Operators” (Minzey), “The Art of Copying Behind” (Candler), “Tales of the Old Timer: Distress” (Bliss), DeForest on pioneers, etc. CQ V2N12 Aug 1933 – Fiction by Volney Mathison, station W2XV silenced (for selling wireless equipment to rum runners), “Micro-Rays”, Aero RDF, etc.